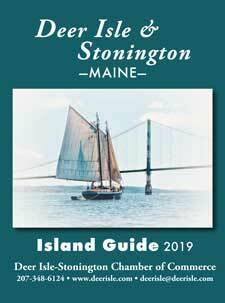 Stop by and visit the Deer Isle – Stonington Welcome & Information Center. It is located on Little Deer Isle about 1/4 mile after crossing the bridge. Our telephone is located in our Welcome Center which is open May through October. During the other months we retrieve our messages on a regular basis. Please leave a message and we will return your call shortly. By car: From the south, take I-95 to Augusta, Rte. 3 East from Augusta to Belfast, connect to Rte. 1 North to Bucksport and then follow Rte. 15 South to the Deer Isle-Sedgwick Bridge. Our Welcome Center is on the first corner on the right hand side after the bridge. From the north, take I-95 to Bangor and then proceed directly onto Rte. 15 South to the Deer Isle-Sedgwick Bridge. Our Welcome Center is on the first corner on the right hand side after the bridge. By plane: Bangor International Airport, 60 miles from Deer Isle, is served by several national airlines. Regional airports within easy driving distance include: Rockland’s Knox County Airport to the south and Bar Harbor Airport to the north. In addition, Stonington has a small 2,000 foot landing strip.